دونات نوعی میان‌وعدۀ شیرین است که به‌طور معمول به‌صورت تخمیری تهیه و به روش غوطه‌وری سرخ می‌شود. بنابراین ازجمله مشکلات آن جذب مقدار زیادی روغن می‌باشد که باید با ابداع روش‌هایی از مقدار آن کاست. دراین‌راستا در این پژوهش اثر پودر پالپ پرتقال در دامنۀ صفر تا 12/5 درصد و هیدروکلوئید زانتان در بازۀ صفر تا 1/5 درصد بر ویژگی‌های دونات به روش سطح پاسخ مورد بررسی قرار گرفت. نتایج نشان داد که با افزایش مقدار پودر پالپ پرتقال و صمغ زانتان، میزان رطوبت، خاکستر، فیبر خام، چگالی، شاخص زردی و قرمزی پوسته و مغز، تباین، همبستگی، آنتروپی، سفتی، صمغیت، قابلیت جویدن و پذیرش کلی افزایش و چربی، روشنایی پوسته و مغز، همگنی، نرمی بافت، پیوستگی، پوکی و تخلخل کاهش یافت. بررسی تیمارها حاکی‌از آن است که جایگزینی 10/73 درصد پودر پالپ پرتقال و 0/04 درصد صمغ زانتان سبب کاهش جذب روغن، افزایش فیبر و تولید دونات سلامتی بخش خواهد شد. احمدی بلوطکی. م. و ناصحی، ب. 1396. بررسی تأثیر افزودن پودر خشک پالپ پرتقال بر ویژگی‌های آرد، خمیر و نان بربری. مجله علوم و صنایع غذایی، 66(14):325-334. داراپور، م. 1396. بررسی تأثیر افزودن آنزیم ترانس گلوتامیناز بر ویژگی‌های دونات غنی‌شده با باگاس نیشکر. پایان‌نامۀ کارشناسی ارشد، دانشگاه علوم کشاورزی و منابع طبیعی رامین خوزستان. دهقان تنها، ل.، کریمی، م. و صالحی‌فر، م.1394. بررسی اثر دو نوع امولسیفایر و آنزیم لیپاز بر کاهش بیاتی دونات روغنی منجمد. فصلنامه علوم و صنایع غذایی، 47(12):207-220. رجب‌‌زاده، ن.1371. ارزشیابی نان‌های سنتی ایران. پژوهشکده غله و نان ایران، 451: 24-18. عجم، م.، نیازمند، و. و گوهری اردبیلی، ا. 1395. بررسی اثر جایگزینی ایزولۀ پروتئینی سویا و دمای سر‌خ‌کردن بر کاهش جذب روغن دونات. فصلنامه علوم وصنایع غذایی ایران، 54(13): 145-153. ماربینی، و.، جوکار، م.، بلندی، م. و چقیورتی، ا. 1395. بررسی اثر صمغ گزانتان بر کیفیت پاستای بدون گلوتن. نشریه نوآوری در علوم و فناوری غذایی، 3(8):45-55. مردانی قهفرخی، آ. و یارمند، م.س. 1395. بررسی اثر افزودن سبوس گندم بر خواص رئولوژیکی خمیر و کیفیت نان بربری. فصلنامه علوم و صنایع غذایی ایران، 50(13): 11-21. AACC. 1999. Approved method of the American association of cereal chemists, 9th end. American association of cereal chemists, Inc., Minnesota. AOAC, 2000. Official Method of Analysis, 17th end. Association of Official Analytical Chemists Inc, Maryland. 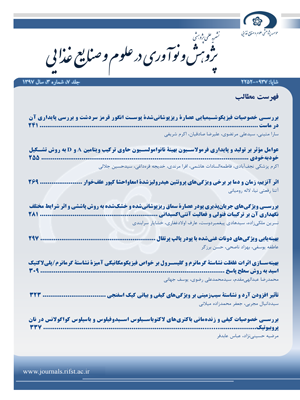 Asfaram, A., Ghaedi, M., Goudarzi, A., & Rajabi, M. 2015. Response surface methodology approach for optimization of simultaneous dye metal ion ultrasound assisted adsorption onto mn doped fe3o4-nps laded on ac: kinetic and isothermal studies. Dalton Transactions, 44(33):14707-14723. Brennan, R.G., Myers, A.S., & Herick, C.S. 2013. Reduction of fat content during frying using dried egg and fiber solution. Eurropean Journal of Lipid Science and Technology, 115(8):946-955.
de Moraes Crizel, T., Jablonski, A., de Oliveira Rios, A., Rech, R., & Flores, S.H. 2013. Dietary fiber from orange byproducts as a potential fat replacer. LWT-Food Science and Technology, 53(1):9-14. Jeddou, K.B., Bouaziz, F., Zouari-Ellouzi, S., Chaari, F., Ellouz-Chaabouni, S., Ellouz-Ghorbel, R., & Nouri-Ellouz, O. 2017. Improvement of texture and sensory properties of cakes by addition of potato peel powder with high level of dietary fiber and protein. Food Chemistry, 217:668-677. Kim, J., Choi, I., Shin, W-K., & Kim, Y. 2015. Effects of HPMC (Hydroxypropyl methylcellulose) on oil uptake and texture of gluten-free soy donut. LWT-Food Science and Technology, 62(1):620-627. Lee, J.-S., Kim, B.-K., Kim, K.-H., & Park, D.-J. 2008. Preparation of low-fat uptake doughnut by dry particle coating technique. Journal of Food Science , 73(3):E137-E142. Melito, H.S., & Farkas, B.E. 2012. Impact of infrared finishing on the mechanical and sensoria properties of wheat donuts. Journal of Food Science, 77(9):E224-E230. Mildner-Szhudlarz, S., Zawirska-Wojtasiak, R., Jzwengiel, A., & Pacynski, M. 2011. Use of grape by-product as a source of dietary fibre and phenolic compounds in sourdough mixed rye bread. International Journal of Food Science & Technology, 46(7):1485-1493. Morris, C., & Morris, G.A. 2012. The effect of inulin and fructo-oligosaccharide supplementation on the textural, rheological and sensory properties of bread and their role in weigh tmanagement:A review. Food Chemistry, 133(2):237-248. Ngadze, R.T., Linnermann, A.R., Nyanga, L.K., Fogliano, V., & Verkerk, R. 2017. Local processing and nutritional composition of indigenous fruits:The case of monkey orange (Strychnos SPP.) from Southern Africa. Food Reviews International, 33(2):123-142. Nouri, M., Nasehi, B., Samavati, V., & Abdanan Mehdizadeh, S. 2017. Optimization the effects of Persian gum and carrot pomace powder for development of low-fat donut with high fibre content. Bioactive Carbohydrates and Dietary Fibre, 9:39-45. Sahin, S., Sumnu, G., & Altunakar, B. 2005. Effects of batters containing different gum types on the quality of deep-fat fried chicken nuggets. Journal of the Science of Food and Agriculture, 85(14):2375-2379. Salem, Y.B., & Nasri, S. 2009. Txtural classification of woven fabric based on a GLCM method and using multiclass support vector machine. P. 7. 6th International multi-Conference on systems, Signals & Devices, Djebra, Tunisia. 23-26 March. Segundo, C., Roman, L., Gomez, M., & Martinez, M.M. 2017. Mechanically fractionate flour isolated from green bananas (M. Cavendish Var. nanica) as a tool to increase the dietary fiber and phytochemical bioactivity of layer and sponge cakes. Food Chemistry, 219:240-248. Sirichokworrakit, S., Intasen, P., & Angkawut, C. 2016. Quality of donut supplemented with Hom Nice Rice flour. International Journal of Nutrition and Fodd Engineering, 10(7):443-446. Tournier, C., Grass, M., Zope, D., Salles, Ch., Bertrand, D. 2012. Characterization of bread breakdown during mastication by image texture analysis. Journal of Food Engineering, 4(113):615-622. Wallecan, J., MmCrae, C., Debon, S.J.J., Dong, J., & Mazoyer, J. 2015. Emulsifying and stabilizing properties of functionalized orange pulp fibers. Food Hydrocolloides, 47:115-123. Zeng, H., Chen, J., Zhai, J., Wang, H., Xia, W., & Xiong, Y.L. 2016. Reduction of the fat content of battered and breaded fish balls during deep-fat frying using fermented bamboo shoot dietary fiber. LWT-Food Science & Technology, 73:425-431.